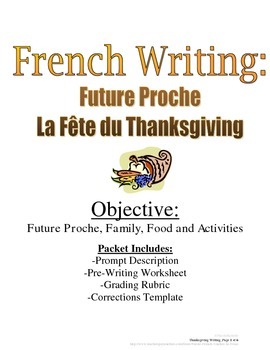 This is a composition to practice with Future Proche, Family, Food and Activity Vocab. Includes a creative prompt for students and a detailed pre-writing worksheet to guide students through the process of writing a letter/essay. For teacher, there is a grading rubric included and composition corrections worksheet. Want easy Quick Lessons to teach tough grammar concepts? Check out my Bundle Options!